In a blender, combine the garlic, lime juice, salt, and pepper. Purée until blended and smooth. With the motor running, pour in the butter and blend until emulsified, about 30 seconds. Keep the sauce warm until ready to serve. (The sauce can be made a day in advance, covered and chilled. Stir and warm before using). Prepare a charcoal grill with medium-hot coals. Drizzle salmon all over with olive-oil and season with kosher salt and freshly ground black pepper. Place the salmon flesh side down (skin side up) on the grill and cook for 4 minutes. Turn the fillets over and grill for another 2-3 minutes for medium-rare or until desired doneness. Remove from the grill and carefully remove the skin. 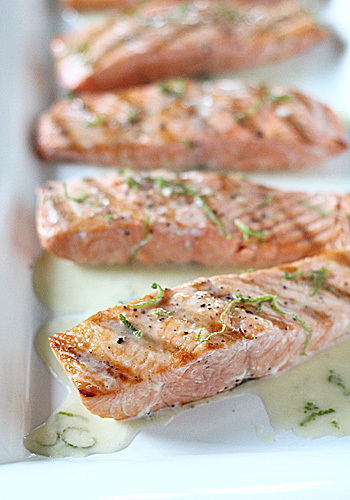 Sprinkle the salmon with the lime zest and serve with the sauce, about 2 tablespoons per fillet. Enjoy! I love these types of easy salmon dishes - they are perfect for weeknight meals! I'm such a salmon fan...so good for you and tastes amazing! I have had good results with quality frozen salmon and that can cut down the costs. Recipe looks great, but just FYI, it's "complement" in this context, not "compliment." Thanks for catching a typo. Looks great. I will substitute lime with lemon as it's Christmas Day and no stores are open! And I will use the BBQ gas grill. All set to try it out! If I use the oven, what temperature would you use and for how long? Thank you. I like to slow roast my salmon in a 225º F oven for 30-45 minutes depending on the thickness of the fillets.